One of the reasons I started writing this blog years ago, was when I realized how much food impacts the well being of my body. At that time I started paying attention to the (often surprising) ingredients of processed food and reduced the amount of meat I consumed. I had read the book Food Inc, watched the documentary Fast Food Nation and even though I am not from the US, the way food is industrialized by means of profit maximization made a deep, lasting impression on me. I`m not a strict vegetarian or vegan pretending to save the world. But we as consumers have a power, higher than you might think. Your choice to buy (or not to buy) determines the ethic & sustainability of the way food is sourced, processed – and what eventually can be found in supermarket shelves. Therefore, we should all think behind the veil of the price tag and make decisions responsibly! Reducing the amount of meat we daily consume, is a small, but impactful step to contribute to the health of our own & the environment! But enough preach for today…I want to start this series of Meatless Mondays with a simple, oriental-inspired chickpea bowl. As a plant-based source of protein, chickpeas are a great substitute for meat! 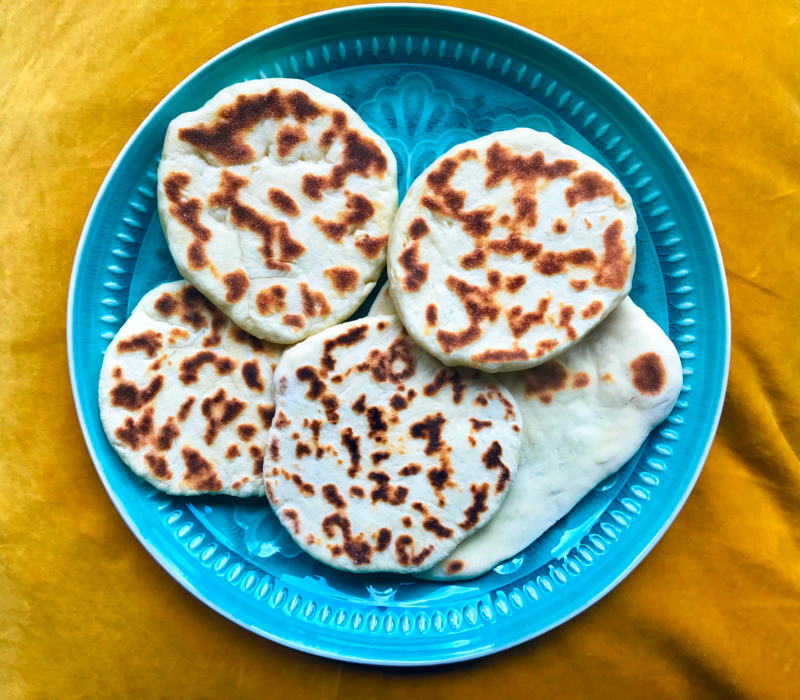 I added a refreshing mint yoghurt and my new love: Homemade Indian Naan bread! The recipe is hands-on and I recommend to enjoy the bread fresh or warmed up in the oven – simply the best :)! Happy Monday folks and next time grocery shopping, remember the power of your shopping cart! Finely chop the garlic and fry it in a pot with some olive oil until golden brown. Add the canned tomatoes and the cubed eggplant. Season with salt, pepper, cumin and harrissa paste. Let it cook for about 15 minutes, add some water (if necessary) and the chickpeas. Let it cook for another 15 minutes. Taste and add any additional seasoning according to your taste! Before derving, sprinkle some freshly chopped coriander and spring onions. Quickly heat the milk until lukewarm e.g. in a microwave and stir in the dry yeast & sugar. Fill the flour into a medium size bowl and form a whole in the middle. Carefully pour the milk into the whole. Mix the milk-yeast mixture with some of the flour from the sides and leave the pre-dough covered at room temperature for about 10 minutes. Add the salt, baking powder and yoghurt and knead everything well to a soft dough. Leave again for about 1 hour. Cut the dough into small portions, depending on how big you want each Naan bread to be, I cut the dough in 6-7 small pieces. Roll out each dough on a floured surface to small flat breads. Heat a coated pan on high tempereature and fry the flat breads (without using oil or butter!). Turn the bread when it starts to get dark spots on one side or the dough gets bubbles. Finely chop the mint and dill. Add the fresh herbs to the yoghurt. Season with salt, pepper, ground cumin & ground coriander. Squeeze the juice of 1/2 lime and stir everything well. You can garnish the yoghurt with additional fresh mint and dill. Posted in Food and tagged chickpea, coriander, meatless monday, mint yoghurt sauce, naan bread, veggie. Bookmark the permalink.